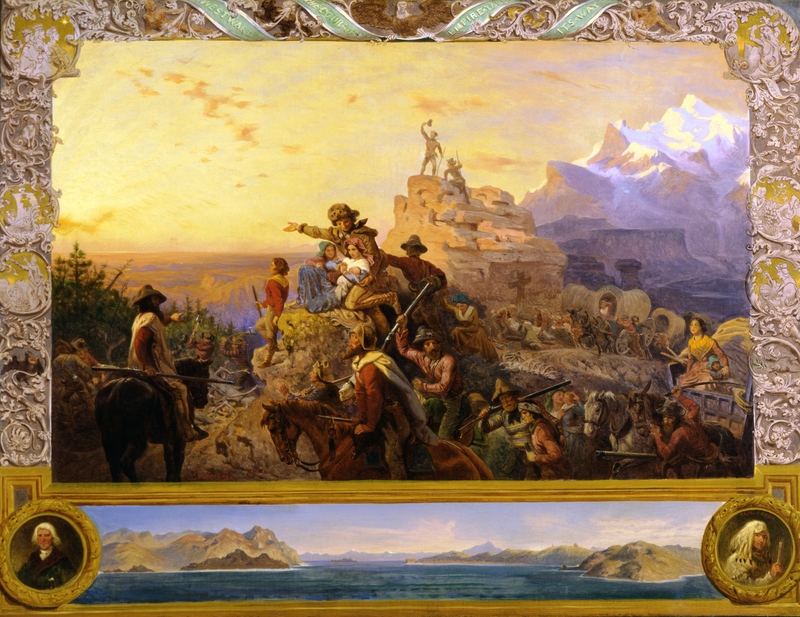 American westward expansion is idealized in Emanuel Leutze‘s famous painting Westward the Course of Empire Takes Its Way (1861). The title of the painting, from a 1726 poem by Bishop Berkeley, was a phrase often quoted in the era of Manifest Destiny, expressing a widely held belief that civilization had steadily moved westward throughout history.” (Caption and photo credit: Manifest Destiny, Wikipedia). See also the Smithsonian American Art Museum, Bequest of Sara Carr Upton. Robert J. Miller has linked Manifest Destiny with the Doctrine of Discovery. The Doctrine of Discovery seems an afterthought. It was formulated in 1823 and legitimized colonialism, but that same year, on 2 December 1823, the Monroe Doctrine put an end to any further attempt to colonize America. Therefore, neither doctrine is particularly edifying. The past, i.e. two to three hundred years of “discovery,” was rationalized by the Doctrine of Discovery, but “discovery” could not be repeated, except by Americans whose “irresistible destiny” was to stretch their boundaries all the way to the Pacific Ocean and, possibly, to the British territories located north of the 49th parallel, the future Canada. So Manifest Destiny, a term coined by columnist John O’Sullivan in 1845, is perhaps best defined using William E. Weeks , except that Weeks’ three themes make “Manifest Destiny” more or less consistent with the notion of American Exceptionalism. Alexis de Tocqueville was the first to use the word “exception” with respect to America. For Tocqueville, American democracy was different from other democracies, but he did not suggest that it was superior to other democracies. On the contrary, other democracies were not to emulate democracy in America. If one adheres to the notion of American Exceptionalism, the President of the United States can, theoretically, invade sovereign countries and effect strikes against other countries. Exceptionalism is a deeply-rooted notion that empowers America. However, it also constitutes a threat to US citizens. The United States remains a superpower, but is it America’s duty to protect the entire world, making itself an intruder, but also placing a terrible burden on the war-weary shoulders of its citizens? Not long ago, President Obama was considering a military strike against Syria, which may have been catastrophic. At any rate, if we step back, the concept “Manifest Destiny” was used not only to colonize Louisiana, but also to annex Texas (1845). Louisiana had been claimed by France and sold to the United States. It was not annexed. Yet, it was inhabited by Amerindians whose displacement is a great tragedy and who were killed quite wantonly as Americans pushed their boundary all the way to the Pacific Ocean, led by God. Manifest Destiny also legitimized the annexation of the Oregon Country, the Pacific Northwest, a disputed territory until the Oregon Treaty, signed on 15 June 1846 in Washington DC. 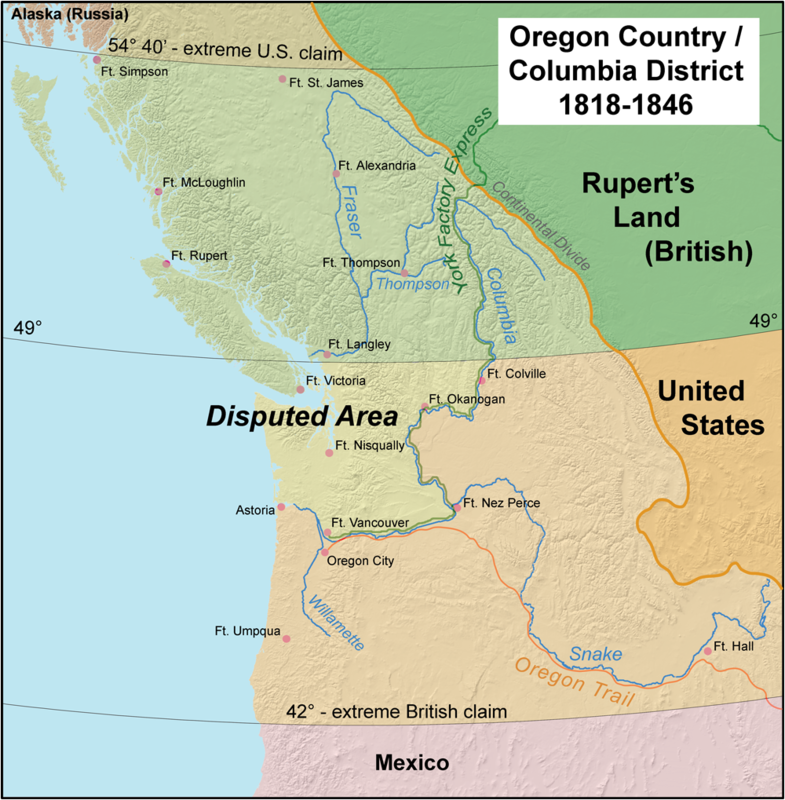 Under the terms of the Oregon Treaty, territory located north of the 49th parallel became British as did Vancouver Island in its entirety. So this is how the West was won, a rather sad chapter in the history of the United States. Sad, because of the displacement of Amerindians. However, as we will see, in the days of “Manifest Destiny,” slavery, formerly a right, morally and legally, was becoming a wrong. Although Exceptionalism served to legitimize the Annexation of the Republic of Texas (1845), it led to the Mexican-American War of 1846. It also served to justify the annexation of the Oregon Country. However, problems arose with respect to the possible annexation of Mexico. On the one hand, nineteenth-century ideology could not allow slavery. But, on the other hand, did the US want to welcome Mexicans, many of whom were métissés, half-breeds. One can dictate away slavery, but not racism. Manifest Destiny threatened to expand slavery and was therefore rejected by prominent Americans (such as Abraham Lincoln, Ulysses Grant and most Whigs and Republicans [today’s Democrats]). (See Manifest Destiny, Wikipedia.) Moreover “[b]y 1843 John Quincy Adams, originally a major supporter, had changed his mind and repudiated Manifest Destiny because it meant the expansion of slavery in Texas.” But what of Métis? Given the degree—the debt-ceiling crisis—to which extremist Republicans opposed and still oppose the Affordable Care Act: sabotage! Given also that, according to the Washington Times, not only has the NSA been listening on the conversations of friends of the United States, but it appears it has also used German Chancellor Angela Merkel‘s mobile telephone to spy on President Obama, it could be that the lofty ideals expressed in the US Declaration of Independence have not been attained. One also wonders whether or not the Civil War is over. [i] Weeks, William Earl, Building the continental empire: American expansion from the Revolution to the Civil War. (Ivan R. Dee, 1996), p. 61. [ii] Robert J. Miller, Foreword by Elizabeth Furse, Native America, Discovered and Conquered: Thomas Jefferson, Lewis & Clark and Manifest Destiny (Praeger: Lincoln Connecticut and London, 2006). [iii] Weeks, William Earl, loc. cit. [iv] Arthur de Gobineau (14 July 1816 – 13 October 1882) wrote an Essay on the Inequality of the Human Races. He developed a theory of the Aryan Master Race. He was a friend of Alexis de Tocqueville, which seems very strange. I apologize for the use of certain words. My mother would be very upset. 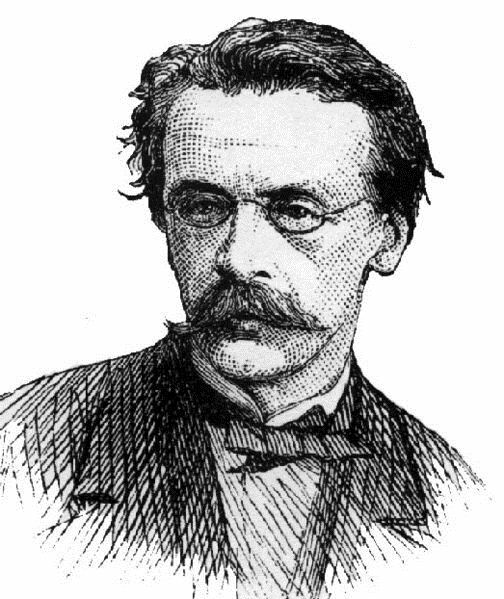 John L. O’Sullivan as he appeared on the cover of Harper’s Weekly in November 1874. O’Sullivan was then attending a conference in Geneva that sought to create a process of international arbitration in order to prevent wars. 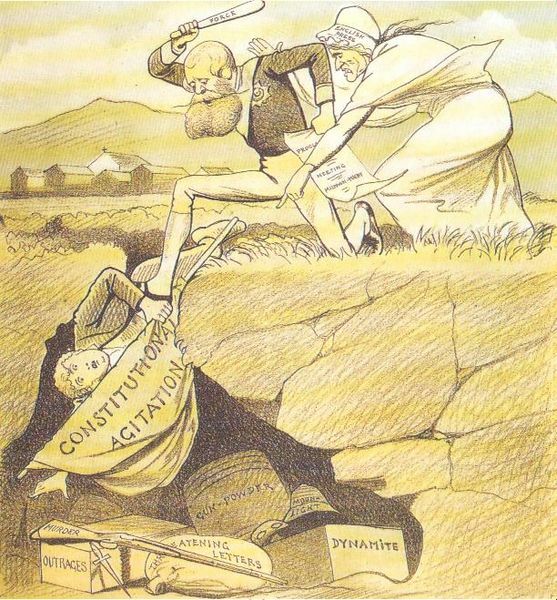 In the middle of the nineteen century a concept developed that supported the notion that the US had the right to expand and that expansion was “prearranged by Heaven.”[i] The term “Manifest Destiny” was coined by John L. O’Sullivan (15 November 1813 – 24 March 1895), in the July–August 1845 issue of the Democratic Review. In an article entitled Annexation, O’Sullivan advocated the annexation of Texas and, later, he would also advocate the annexation of the Oregon Country. In the mid-nineteenth century, Americans used “Manifest Destiny” to justify expansion, at any cost, beyond Louisiana Territory. What stood in the way of “Manifest Destiny” was slavery. John Quincy Adams (11 July 1767 – 23 February 1848), the sixth President of the United States (1825–1829), had adhered to the notion of “Manifest Destiny,” but he opposed expanding slavery. Andrew Jackson (15 March 1767 – 8 June 1845), his successor, was a slave-owner who supported slavery and played a role in the Indian removal. 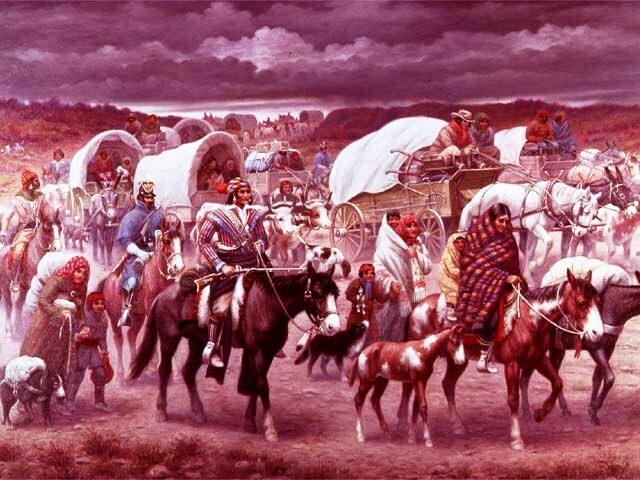 The Indian Removal Act (1830)[ii] was signed into law on 26 May 1830 and forced thousands of Indians living East of the Mississippi River to relocate West of the Mississippi River to Indian Territory and Oklahoma Territory. “Manifest Destiny” reminds me of the doctrine of the divine right of kings. In the mind of Jacques-Bénigne Bossuet (born 25 Sept. 1627, Dijon, Fr.—died 12 April 1704, Paris), arguably the most eloquent preacher in the history of France, kings were accountable to God only. Provinces entered into Confederation progressively, which constitutes a main characteristic of Confederation. 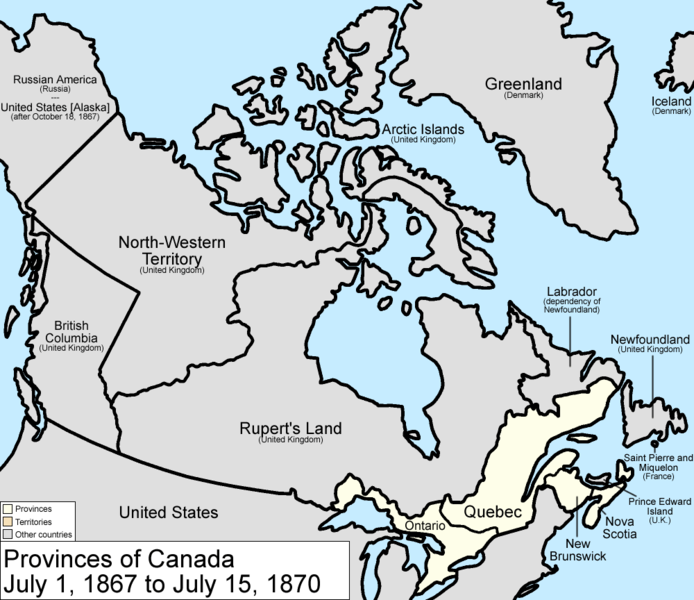 When the Federal Dominion of Canada was formed, on July 1, 1867, one British colony, the British Province of Canada, was divided into the new Canadian provinces of Ontario and Quebec and two other British colonies, New Brunswick and Nova Scotia, joined Ontario and Quebec. In other words, three British colonies were formed into four Canadian provinces on July 1, 1867. Manitoba joined in 1870, followed by British Columbia, in 1871, bringing the number of provinces of the Dominion of Canada to six (6). Prince Edward Island (7) joined on July 1, 1887, Saskatchewan and Alberta, on September 1905 (8 & 9). However, the tenth province, Newfoundland, now Newfoundland and Labrador, did not join until 1949 (10), under Joseph Roberts “Joey” Smallwood, PC, CC (December 24, 1900 – December 17, 1991), Newfoundland’s first Premier. As for the Northwest Territories and Yukon, the rest of what would constitute the Dominion of Canada, they entered into Confederation respectively in 1870 (the Northwest Territories) and, the Yukon, in 1898. 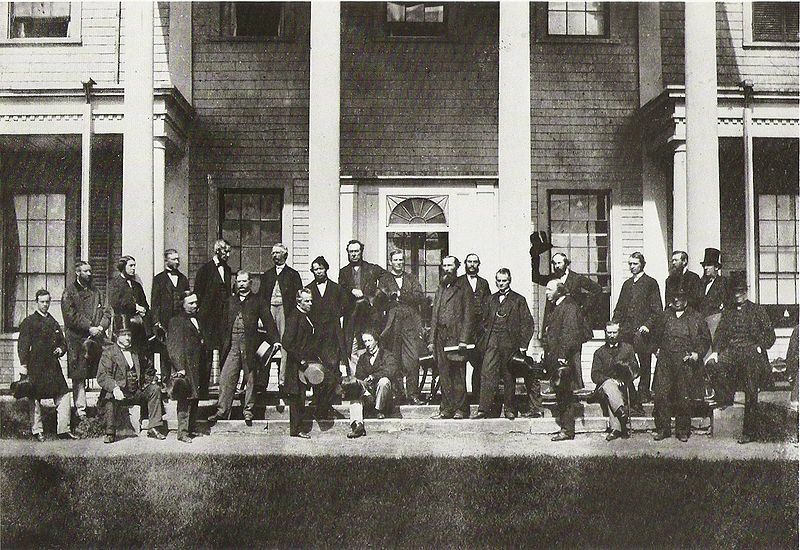 There was reluctance to join Confederation on the part of the three Atlantic provinces: New Brunswick, Prince Edward Island and Nova Scotia, once called collectively Nova Scotia. They simply had no need, a crucial factor, to enter into a partnership with British Provinces to the West. Quebec stood to regain its Lower Canada, which was important motivation. However the initial reluctance on the part of the Atlantic provinces was overcome when, as mentioned above, US expansionism became a threat to Britain’s colonies in North America. However, threats did not emanate from believers in the Manifest Destiny, but from Fenians who were attempting to invade the British colonies north of the 49th parallel. The first threats from the US had little to do with the expansionist Monroe Doctrine. On the contrary, attempts to invade lands north of the border were made by Fenians, an Irish Brotherhood: the Fenian Brotherhood devoted to building an independent Irish Republic (Irish Republican Brotherhood: IRB). In Britain, the Fenians were promoting trade unionism as well as armed revolution to further their goals. Consequently, Fenians, were poor candidates for American citizenship. Yet, they found their way across the Atlantic to the US. The US branch of the Fenian Brotherhood, was founded by John O’Mahony and Michael Doheny,[iii] the author of the Felon’s Track, a Gutenberg Project EBook (simply click on the title: Felon’s Track to read). As well, the Great Irish potato famine (1845 and 1852) had led to massive emigration to the United States and to Canada, but I do not think the Irish Potato Famine refugees can be associated to Fenianism. They arrived in North America between 1845 and 1852. In Canada, the Fenians first attacked the Missisquoi County, in the Loyalist Eastern Townships, the area of Canada where I live. But other Fenians targets were Campobello Island, New Brunswick (United Empire Loyalist country), which they attacked in April 1866, and the current Ontario. In the current Ontario, about a thousand Fenians crossed the Niagara River on June 1, 1866 under Colonel John O’Neill. The Fenians then attacked the future western provinces of burgeoning Canada all the way to the Pacific Ocean. In Ottawa, Patrick James Whelan was hanged, perhaps too hastily, for the murder of Thomas D’Arcy Etienne Hughes McGee, PC, (April 13, 1825 – April 7, 1868 ). D’Arcy McGee was an Irish nationalist but he was also one of the Fathers of Confederation, which had just been achieved. In other words, the Fenians raids played a significant role in bringing about Confederation, as did the Oregon Treaty of 1849. So, ironically, aggressiveness on the part of the United States was to be feared by Britain’s colony to the north of the United States, but in a man the British provinces had not suspected. In fact, European nationalism had also fuelled French-Canadian nationalism. When Lord Durham suggested the Union of Upper and Lower Canada and the assimilation of French-speaking Canadians, he inadvertently gave great impetus to French-Canadian nationalism, which, as mentioned above, helps understand why French-speaking Canadian leaders living in what would be the Province of Quebec, supported Confederation. So a threat from the US, the Irish Republican Brotherhood, or the Fenians, led to Atlantic Canada’s willingness to join the Confederation. Under Confederation the Atlantic provinces gained muscle. Newfoundland, however was beyond the grasp of Fenians. Other provinces would join after 1867, but there had a need or something to be gained. In the case of British Columbia, the construction of a railway would be condition and a need. 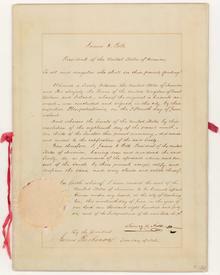 [i] Under the terms of the Oregon Treaty of 1849, Britain ceded it claims to ownership of land south of the 49th parallel. But it kept Vancouver Island and coastal islands as well as Vancouver. [ii] Canadian Pacific Railway, History, http://www.cpr.ca/en/about-cp/our-past-present-and-future/Pages/our-history.aspx. The General Manager of the Company was William Cornelius Van Horne.